Are you a developer looking for free Bootstrap themes and templates for your personal site or side project? You’ve landed on the right page! Bootstrap is one of the most popular open-source front-end frameworks among developers. The great thing about using a Bootstrap theme for building a site is that you don’t need to worry about the design. It enables you to set up a professional-looking, well-designed site in a few days or even a few hours in some cases! 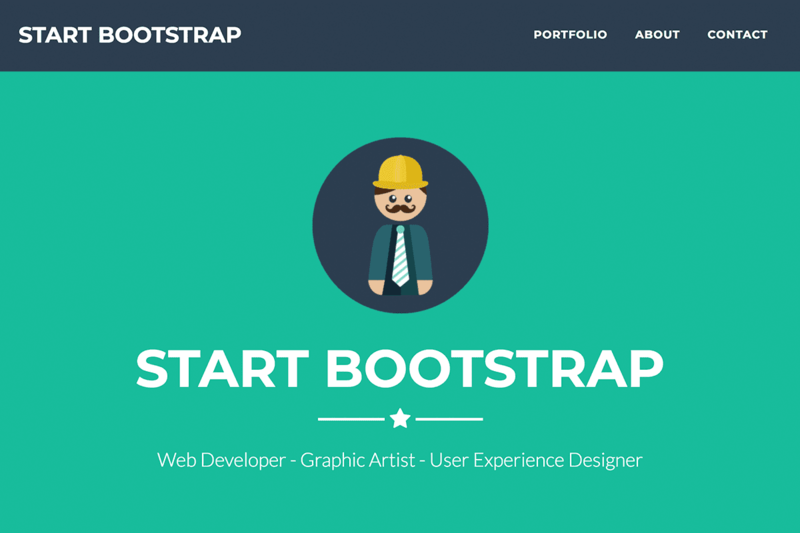 You can find tons of Bootstrap themes and templates available on the internet. But few of them are made for developers’ personal sites and even fewer are free. Don’t have the time to wade through the internet to find the perfect Bootstrap theme? Want to find quality themes and templates you can actually use for your site as a developer? 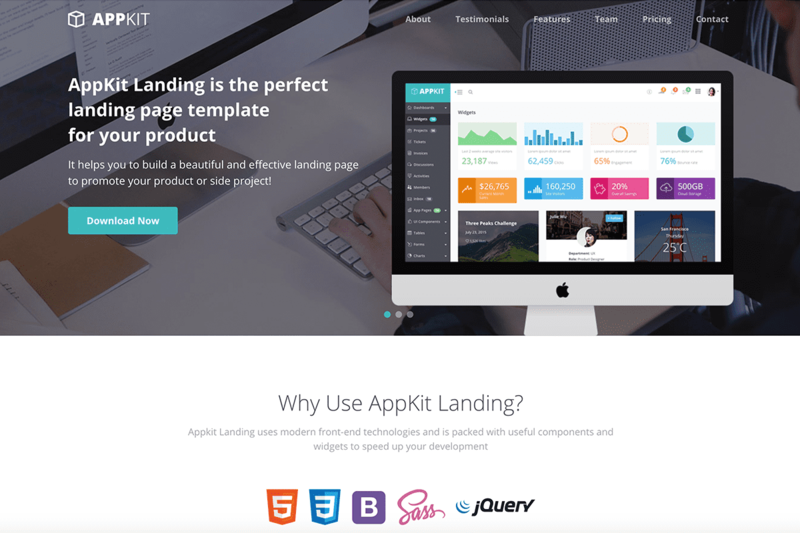 We’ve hand-picked 10 of the best Bootstrap themes and templates you can use right away. They’re designed for YOU and FREE! 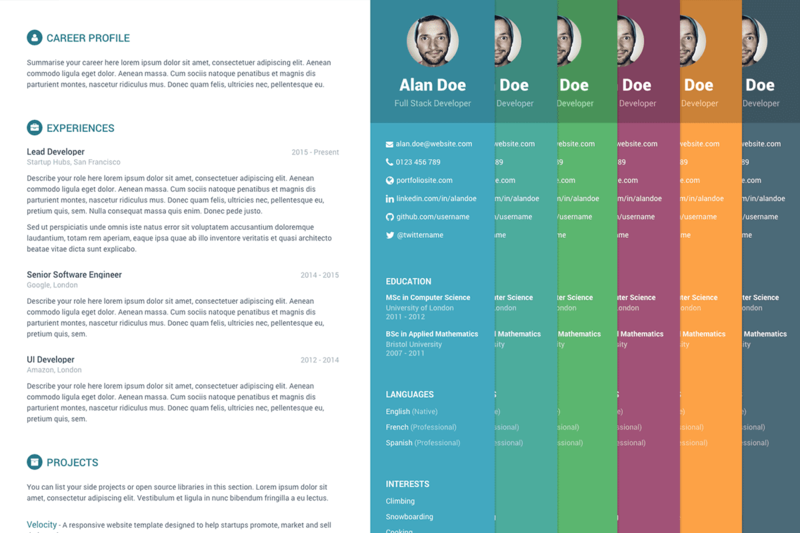 Pillar is a free Bootstrap 4 resume/CV template designed for developers. It has everything you need to structure a winning online resume. The template includes all the SCSS source files so it’s quick and easy to do any customisations. You can also choose from 6 nice colour schemes to save time. Want to stand out from the crowd when you applying for tech jobs? Download Pillar today and you can set up your online resume in minutes! 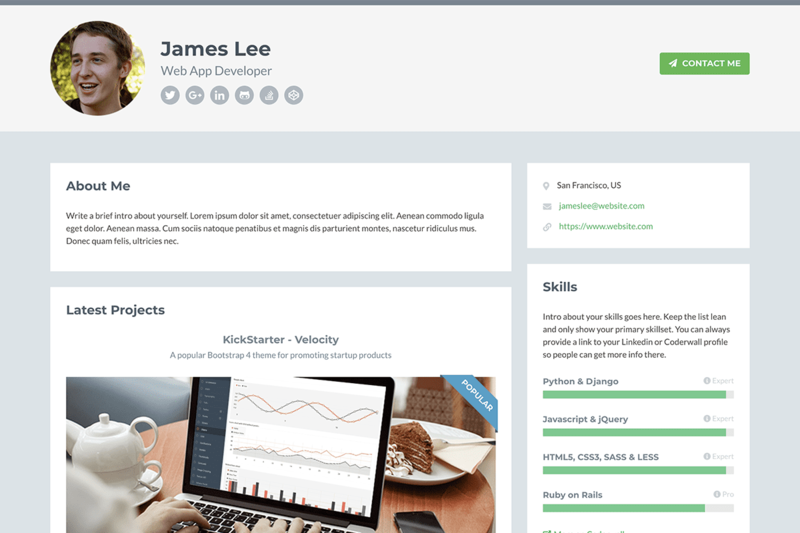 Orbit is a popular free Bootstrap resume/CV theme made for developers. It has over 185,000+ downloads since initial release. Like the Pillar theme above, it’s built on Bootstrap 4, SASS and comes with 6 default colour schemes. It will let you make different versions of your online resume to target different jobs. Want to impress your potential employers or clients? Download Orbit now and start building your online resume today! 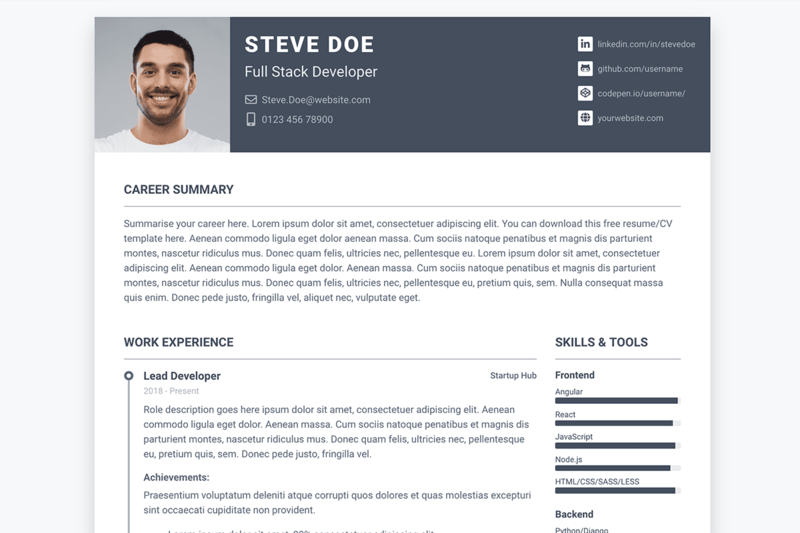 Resume is a landing page style resume template built on Bootstrap 4. The design resembles a powerpoint presentation with the navigation fixed to the left. Although it’s called “Resume”, it makes a good base for building your online portfolio too. Developer is a popular free Bootstrap 4 portfolio theme. You can use it to build a standalone portfolio site. Or you can use it as your professional portal and link to your other web presences (eg. Linkedin, Codepen, StackOverflow, Blog, GitHub etc). So far, 218,000+ developers have downloaded the template. Don’t miss out! 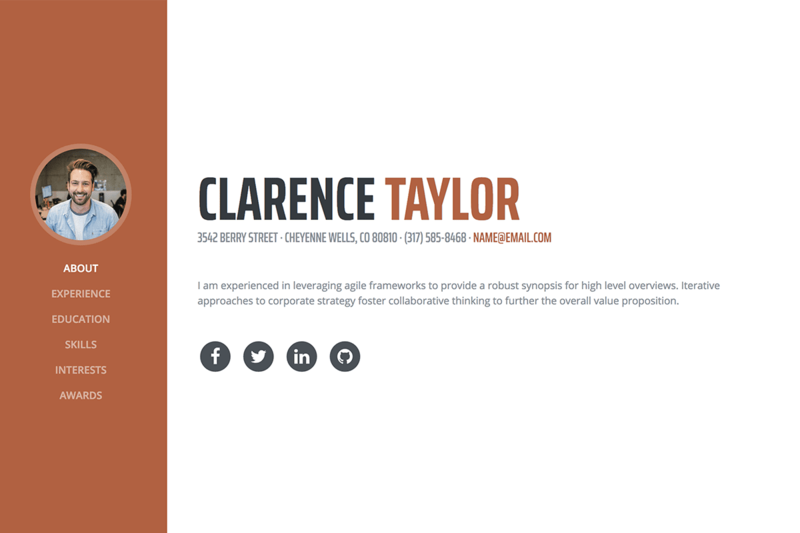 Want to set up a professional-looking portfolio site in a day? Download Developer theme and your site can be up and running in a few hours! 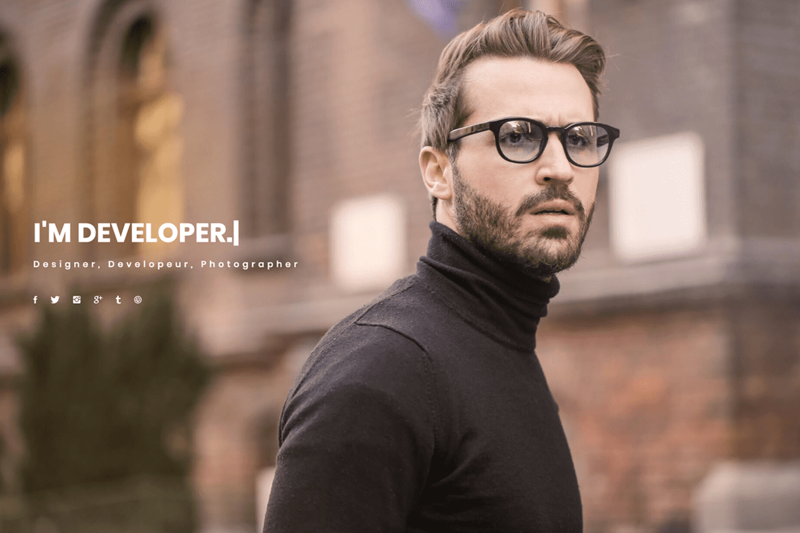 Freelancer is a Bootstrap 4 portfolio template suitable for freelance developers. The template’s design is nice and clean. And it also includes an easy-to-edit PHP contact form to save you time! Folio is a Bootstrap 4 template you can use to showcase your portfolio and work. The design is elegant and clean. If you have a good high-quality image of yourself you should give this template a try. Are you a developer planning to start your own coding blog? 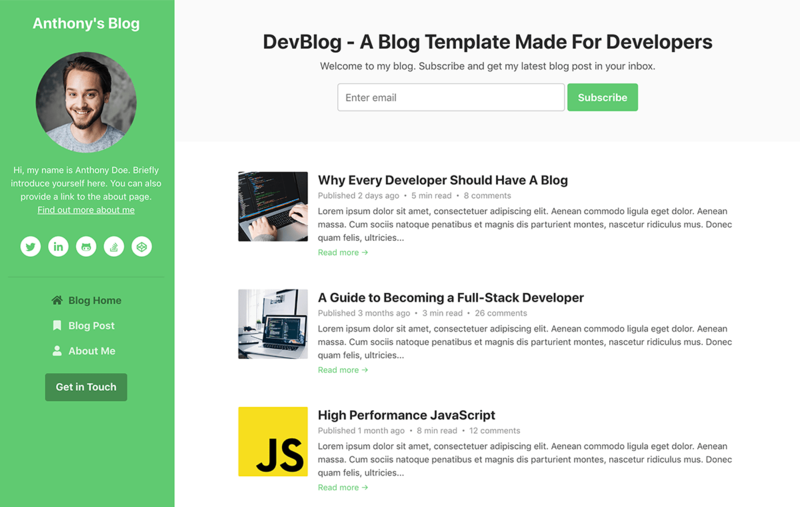 DevBlog is a free Bootstrap 4 blog template made just for you. The design is super clean and professional and it provides a great reading experience for users on desktop and mobile. 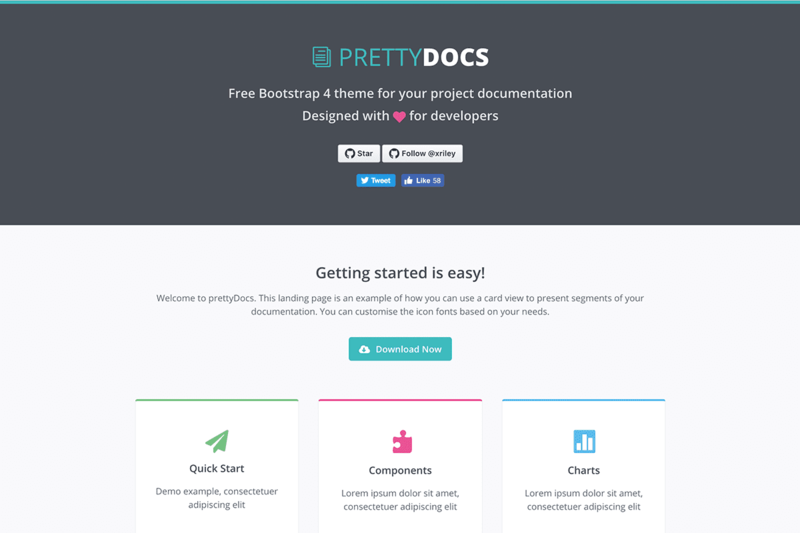 PrettyDocs is a Bootstrap 4 project documentation theme made for developers. It comes with 6 vibrant colour schemes and includes lots of useful components you can use. Launching your open-source or commercial project? Download PrettyDocs and it can help you get your project site online fast! 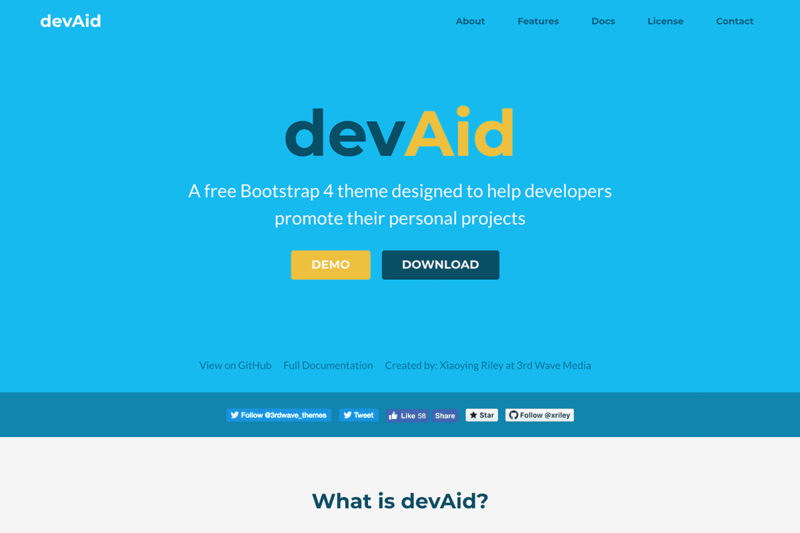 devAid is a Bootstrap 4 theme designed for promoting developers’ side projects. You can use it as your project’s landing page. It’s the perfect base for building your GitHub project page. Want to promote and market your side project? Get devAid today and start getting tractions! Want to have a landing page for promoting your product? Appkit Landing is the Bootstrap 4 template you must check out! It has everything you need (eg. pricing table, customer testimonials etc) to sell your product to your potential customers. And it’s quick and easy to set up. Starting your own startup? Download Appkit Landing today and put your product out there! 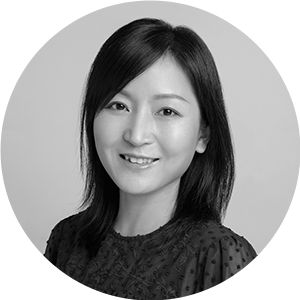 Xiaoying Riley is a product designer at 3rd Wave Media. She makes free Bootstrap themes for developers. She tweets about UX design and web development related content. Follow her on twitter so you don't miss any future freebies!